Summary: Skeptic and journalist Guy P. Harrison explores everything from Atlantis to psychic powers, global warming, and the Holocaust. With 50 varied topics, he covers everything you ever wondered about and things you never cared to know. If you are a skeptic, you will love this novel, however if you’re looking for concrete evidence over arguments, seek for it elsewhere. I had a lot of trouble with this book, and it wasn’t for lack of trying. When I purchased it I was genuinely interested in reading a scientific take on the paranormal and the various mysteries of the universe. 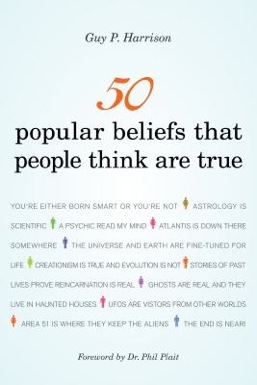 The problem: I seemed to be under the impression there would be concrete evidence to support most of these beliefs, which is silly considering if there was incontrovertible proof against ghosts and cryptozoology we would have seen it. Strike one: my perception of the world. Although to be fair, I didn’t hear anything about a giant squid being captured until I saw a special on the Discovery Channel, so anything is possible. This is where the problem lies in this novel, there are more arguments than evidence. As is touched upon in this book, it’s incredibly hard to disprove stuff. We can point others in the right direction with reason and logic, but evidence that completely says these beliefs are false is hard to come by. For example, it should be easy to prove the Loch Ness Monster is real (a body), than to disprove it, the only way to do that would be to completely drain Loch Ness and not locate a sea monster. A lack of proof doesn’t necessarily mean that something isn’t true. I am of course applying this to the more fantastical ideas, not necessarily topics about biological race, evolution, and alternative medicine. Genre: Non-fiction, memory, psychology, humor, you will be too lazy to do any of this in your daily life. Summary: After covering the U.S. Memory Championship, journalist Joshua Foer becomes intrigued with the human ability to remember, and spends the following year of his life researching and practicing to be the next U.S. Memory Champion. 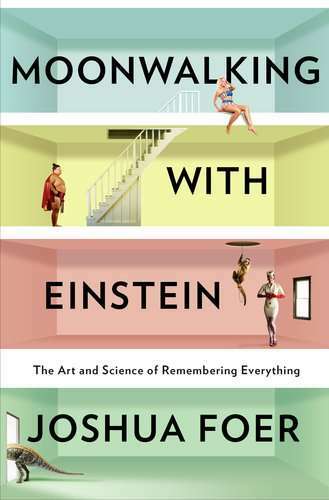 Part memoir, part history lesson, part psychology course, Moonwalking with Einstein is an amusing look at the world of memory competitions and an intriguing study in the capabilities of the human mind. If the name Joshua Foer sounds familiar, it’s probably because his brother is Jonathan Safran Foer, author of bestselling novels Everything is Illuminated and Extremely Loud and Incredibly Close. Because of Jonathan, I had an extremely awkward conversation with my ex-boss about how he keeps memories in Ziploc bags. Thankfully I have nothing against Joshua (no Safran) Foer, who helped me memorize a random stranger’s shopping list. In the driveway of my childhood home there is a giant jar of pickled garlic, on the porch is Claudia Schiffer bathing in a swimming pool of cottage cheese, in the living room where we used to keep our Christmas tree is peat smoked salmon. Next to it on the maroon couch are six bottles of white wine having up-tight conversations with one another. On the side table hanging from a lamp are three pairs of brightly coloured socks, three women are hula-hooping on our dining room table. In our kitchen where I used to mess around with Play-Doh a man in a snorkel is about to dive into our kitchen sink while a dry ice machine is on full blast next to him. My father is at the kitchen table on the computer, emailing a she-male named Sophia.